Home / QuiBidder of the Week – Antonio G.
Congrats to the newest QuiBidder of the Week, Antonio G.! You might recognize Antonio from the QuiBids Facebook page — he recently shared some photos of his wins! 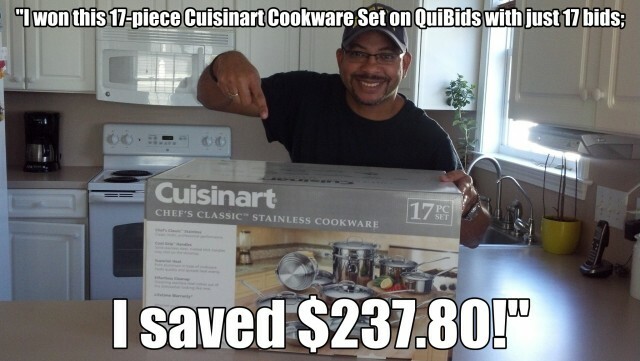 Continue reading to catch Antonio’s bidding story to learn how he won the Cuisinart 17-Piece Cookware Set on QuiBids with only 8 bids remaining in his account. “This is funny, I bought a 12-Piece Cuisinart Cookware Set for my wife in December 2013 for Christmas for $169 in Kohl’s. My wife got pretty upset with me because we couldn’t afford that and I just borrowed the money from my mother to be able to buy it. When my wife found out about how much the cooking set costs, plus the money that I borrowed from my mother, she made me take the cooking set back to the store to get my money back and return it to my mother. I was so sad about it because I want to give my wife a good present for Christmas. She is a great wife and she deserves it. I first tried to go after the 33-Piece Cookware Set, but I wasn’t successful, and I ended up losing some bids. One night after dinner, my wife and me sat down together in front of the computer just watching the auctions on QuiBids, until the we saw a 17 Piece Cuisinart Cookware Set auction about to start. Then I started bidding. I was a little nervous at first, and my wife began asking me why I was so nervous. I replied to her, “I am nervous because I promised you a Cuisinart Cookware Set and this is the one I want to get for you. Just wish me luck, because you have always been so good to me and I want to get you a belated Christmas gift tonight.” I had a lot of faith in myself that night, plus I had this feeling in my heart that this Cuisinart Cookware Set was the one that I want to give her. I only had 26 bids left. When I was bidding on my 15th bid, I realized my wife was holding my left arm and putting pressure on it with her hands – She was nervous just like me! When I placed my 17th bid I just said myself “PLEASE, PLEASE, PLEASE,” and I closed my eyes with 10 second remaining on the clock. My heart was beating at about 100 miles per hour because I was getting close to my last bid. Then suddenly, I heard my wife screaming and jumping all around the room. I opened my eyes. SURPRISE! I just won the 17-piece Cuisinart cooking set with only 17 bids. What a coincidence. It was incredible. I was so excited and happy because I managed my goal – I promised my wife the cooking set and I got it for her! Now she is super happy and loves her new cooking set.